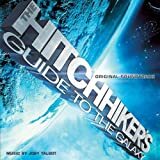 Accueil Produits Bande originale La bande originale de “H2G2 : le guide du voyageur galactique”. La bande originale de “H2G2 : le guide du voyageur galactique”. Sortie : 26 avril 2005. Film : H2G2 : le guide du voyageur galactique. So Long & Thanks For All The Fish (par Hilary Summers, Kemi Ominiyi & The R’svp Voices) – 2:26. Arthur Wakes Up – 2:53. Shoo-Rah! Shoo-Rah! (par Betty Wright) – 2:51. Here I Am (Come And Take Me) (par Al Green) – 4:13. Destruction Of Earth – 1:31. Journey Of The Sorcerer – 1:15. The Hitchhiker’s Guide To The Galaxy – 1:14. Inside The Vogon Ship – 2:46. Vogon Command Centre – 1:00. Trillian & Arthur Reunited – 1:45. Pan Galactic Gargle Blaster – 1:40. Tea In Space – 1:08. Infinite Improbability Drive – 0:55. Viltvodle Street Music – 0:45. Capture Of Trillian – 4:27. Planet Factory Floor – 2:29. Earth Mark II – 6:29. Magic Moments (par Perry Como) – 2:37. So Long & Thanks For All The Fish (Reprise) (par Neil Hannon) – 2:54. Vote Beeblebrox (par Andy Dunlop, Chuck Norman, Douglas Payne, Fran Balke, Hannah Thomas, Miggy Barradas et Neil Hannon) – 3:27. Reasons To Be Miserable (His Name Is Marvin) (par Stephen Fry) – 3:37.